About four hours' drive east of Los Angeles, there is an attraction that is worth visiting the Mitchell Cavern. Limestone caves carved in the form of this nature, it could be your outdoor holiday options when to the United States. Being in the Providence Mountains State Recreation Area, Mojave Desert, these limestone caves are formed in the late Pleistocene era, about 100,000 years ago. The process begins when the water content of the soil with rich mineral deposited and metamorphosed into the limestone. Mitchell is also famous for the cave people of his master Chemehuevi this cave for many centuries. They made ​​the cave as a sacred place used for ceremonies and ancient rituals. Therefore, the Chemehuevi are not graced with a pictograph or petroglyph cave is much more visible in the cave. Even so, in the hills around the cave you will see the carved stone, a silent record of the life story of the people who have lived in caves. If you want to visit, Assume you're in Los Angeles, to arrive at Mitchell Cavern you can take the path east to Interstate 10 and Interstate 15 north to Interstate 40 east. 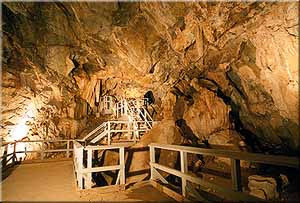 Mitchell Cavern recreation area opened on Saturday and Sunday at 13.30 local time. For groups of 10 persons or more reservations are required three weeks in advance, with a limit of 25 people per tour. If you want to camp, you can find six campsites are equipped with a desk, and place a campfire and roasting.